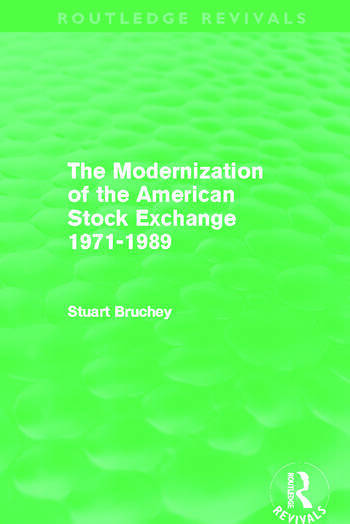 First published in 1991, Stuart Bruchey’s study is a historical tribute to the financial innovation of the American Stock Exchange. He chronicles the heyday of Wall Street – from events leading to the Great Depression, through the New Deal and World War II, to the electronic era, the crash of’87, and the new realities and global opportunities of the 1990s. We observe with fascination the transformation of the relocated outdoor Curb market on Broad Street to its cavernous indoor trading facility on Trinity Place, where it’s been ever since – the first trading "posts" topped with light fixtures reminiscent of the outdoor lampposts they replaced. Bruchey relives for us the introduction of the first CRT terminals on the trading floor and the gradual, yet inevitable, influence of technology on the trading process. His study of modernization brings us right into the world of equity options, derivatives and other creative products introduced in latter part of the twentieth century – investment vehicles designed to serve an increasingly sophisticated and demanding marketplace of investors.